I found a sandwich bag full of black and white photos from the 1940s and 50s in a little shop in Allen, Michigan. At one time, the photos were in an album, as evidenced by remnants of the black paper pages clinging to the back. A handful of the photos contained writing on the back, and only one revealed a full name, an 8th-grade school photo of Clara Farr. The good news was that Clara was easy to spot in many of the other images, which helped me to eventually piece together the story behind these family photos. In this post, I am sharing the photographs of the family taken during a Christmas get together. Clara’s husband, Roy Heard, appears in the photos, which leads me to believe they were taken sometime in the late 1940s or early 1950s, as the two were married on June 11, 1948, in Dearborn, Michigan. Frank and Edna Farr standing; Lester Farr on the far left; Clara (nee Farr) Heard seated, turned looking at the camera; Roy Heard seated to her right. 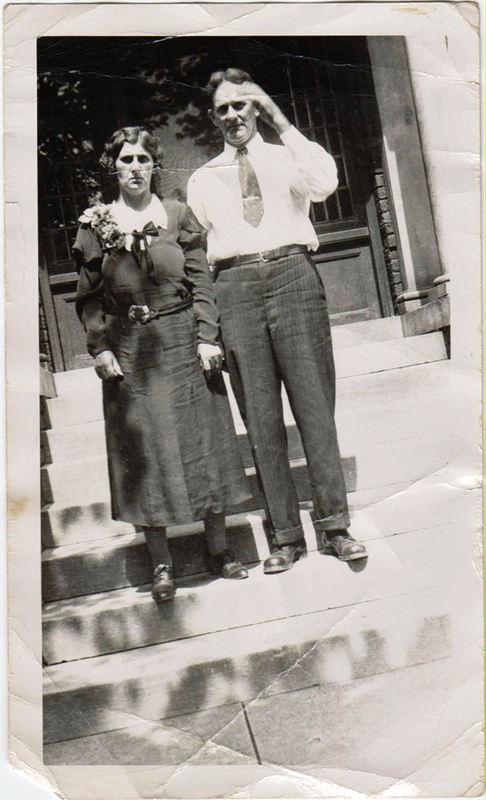 And what better way to begin, than with the story of Frank and Edna Farr, Clara’s parents, as my discovery of the photos resulted in solving a decades-long family mystery that surrounded the couple! Francis Hubert Farr, or Frank, as he liked to be called, was born September 15, 1885, in Belleville, Wayne County, Michigan, the son of Adelbert and Mary (nee Steward) Farr. Edna Irene Winekoff was born September 18, 1897, in Sumpter Township, Wayne County, Michigan, the daughter of William August and Mathilda (nee Nimps) Wienkauff. Her parents had immigrated to the US from Germany in 1877. Frank and Edna fell in love. There was just one problem. Frank was already married to Edna’s older sister, Augusta. Frank and Augusta married in 1906; he was 20 and she was 21. It’s not clear when Frank and Edna began their love affair, but in 1915 they would no longer be able to hide their secret…. Edna was pregnant. On September 30, 1915, while attending a dance in Belleville with her parents, Edna ran away. Her parents, oblivious to their daughter’s love affair, suspected foul play and were beside themselves with worry. Newspapers ran the headline “Belleville Girl, Attending First Dance, Disappears,” and reported that Frank had also gone missing days later. Frank’s house in Belleville was destroyed by fire and before his disappearance, he collected a $1,400 insurance check (which would be equal to $30,000 in today’s value). Edna’s mother, in response to those who would entertain the idea that the two had run off together, said: “Edna never liked her sister’s husband.” Her family described her as being 5 feet 6 inches tall, weighing 125 pounds, having a medium dark complexion, blue eyes, very thick, long brown hair, a scar on her left cheek, and scald scars below her left ear and on her chest. It was detailed that she carried an engraved watch, was wearing a black and white muslin dress when she went missing, was fond of singing church hymns, chewing gum, and kept no company with males. On December 23, 1915, Frank and Edna were married in St. Paul, Minnesota, although Frank’s marriage to Augusta had not been dissolved. This is when Frank began using his middle name of Hubert. According to their marriage certificate, they were living in Barron County, Wisconsin at the time. They welcomed a baby daughter named Irene Edna on April 26, 1916, in Jamestown, North Dakota. Irene, however, as the result of her parents attempt to keep their secret hidden, would grow up believing that she had been born on October 1st. Frank worked as a locomotive fireman for the Midland Continental Railroad. His father’s brother, Hugh Farr, resided with them in North Dakota. I wonder if that’s why the couple settled there. I suppose that’s something we may never know. A son, Hubert Francis Farr Jr., was born on September 13, 1917. Opal Gladys was born November 17, 1923. Sadly, she died during early childhood and is buried in North Dakota. The couple returned to Michigan, where their daughter, Clara Matilda, was born on September 17, 1928. They were living in Lincoln Park, and Frank was working as an auto worker. By April 1930 they had moved once again and were residing in Edgewater, Wisconsin. Frank was working as a farmer and his younger brother, Lester, and his family were living next door. They didn’t stay in Wisconsin for long, as they were back in Michigan when their youngest child, Russel George, was born May 12, 1933. 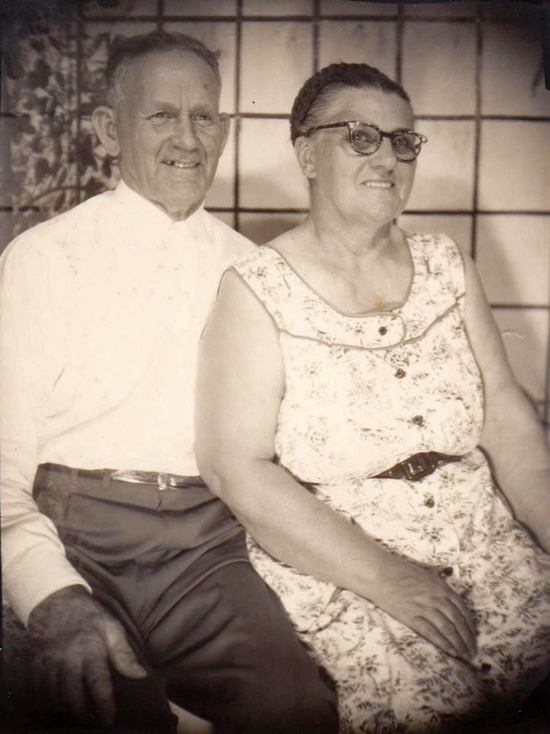 In 1940, Frank and Edna were living in Taylor, Michigan, where they would remain until their deaths. At the time, Frank was working as a painter on a government project. In 1942, he was employed at Nelson Baker Drug Company. His granddaughter told me that he was also a carpenter and built many houses in Taylor. He died August 15, 1960, aged 74. Edna died December 20, 1979, aged 82. So, what became of Augusta? In 1920, she was living in Detroit, Michigan with Harry Allaire, as his wife, although the two were not officially married until September 16, 1922, after she obtained a divorce from Frank in June of that year. She died May 26, 1976, in Garden City, Michigan, aged 91. During my research of the family, I came across an obituary that named a few of Frank and Edna’s grandchildren. I contacted a granddaughter, Georgia Farr-Stanifer, and that is how I learned of the family mystery involving Frank, Augusta, and Edna. She was excited to see the newspaper articles about her grandparents and loved the idea of their story and photos being featured on the blog. I really enjoyed being able to talk to her about her grandparents and I’m very happy that I can reunite the photos with the family! Georgia told me how much she loved her Grandparents and that she was the apple of her Grandfather’s eye. I think that’s very evident in this photo that she shared with me. 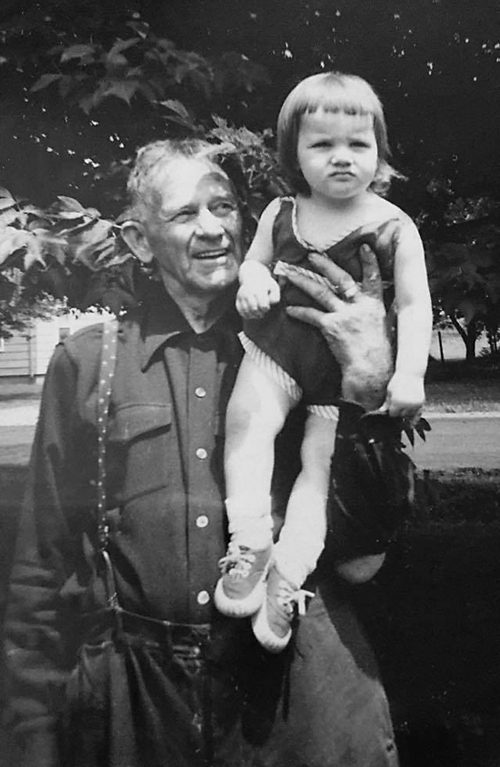 Frank and granddaughter, Georgia Farr, July 1958. Fascinating story and wonderful research. Brilliant!